We have discovered that by IMPORTING RARE HORN & then sending these selected Pieces to the MASTER CARVERS in MALAWI and Asking for our very own EXACT designs to be carved into these and then see them BEAUTIFULLY hand carved when they are returned to us, we then start the most difficult part of the exercise, that is to turn these into works of art, they are made from the solid tips, drilled and fitted as a Magnificent SHAVING BRUSH , FUSION or MACH 3 RAZOR. When this task is completed then the LABORIOUS labour of love comes into play, starting with a coarse polish and after a few days and 15 various wheels and grades of polish they receive the FINAL hand polish & Inspection. 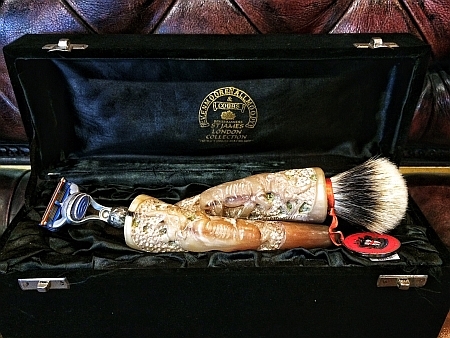 These have never been seen before and are sold as a 2 piece set or a single shaving brush. Each one is unique and presented in a large hand made wood box. The outside being covered in velvet and satin silk inside. 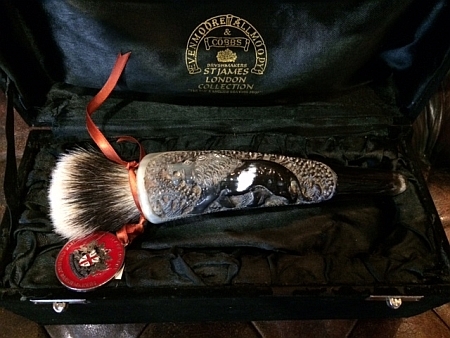 We were asked by our collectors to make other animals too, so we made single brushes in lion and elephant. We believe that each one should do a little to help and we DONATE to the worldwide save the rhino fund as for every pound donated the British Government gives a further 25 percent to help the cause. The White Rhino live in South Africa they have recovered from near extinction, the Black Rhino is the smaller of the two African species they are critically endangered. The Greater One Horned Rhino's are adapted to living close to bodies of water, in the flood plains and forests of India and Nepal, their conservation status is vulnerable. The Sumatran Rhino is critically endangered they live in the Tropical Forests in Sumatran and the foot hills of Bhutan and North West India. The Juvan Rhino is the rarest of the Rhino species, they can now only be found in Ujung Kulan National Park. 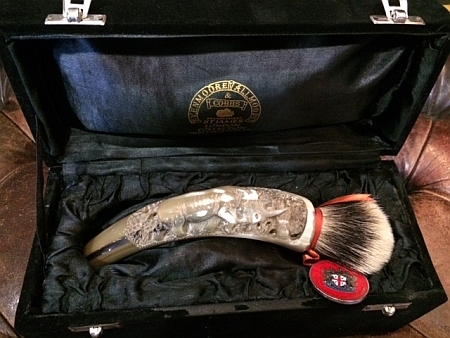 The 2 piece rhino set in Mach 3 or fusion razor and similar horn brush is R 9995. 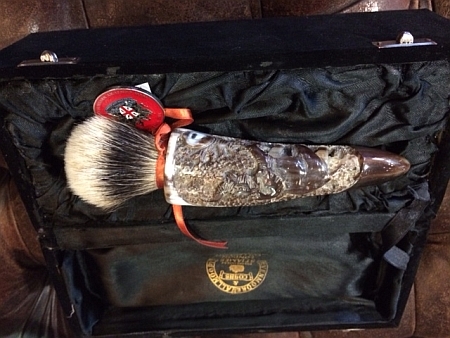 The single brush is available In Elephant ,Lion and of course RHINO, it sells for R 5999 a really nice gift for today and an Investment for the future Generations.